Managing the finances for a regional group of hair salons is a fast-moving process. Every day is different, transactions are high volume, and the wait for funds to clear can make it hard to get a true, up to date picture of a company's financial position. With conventional accounting, stringent financial management usually requires massive attention to detail and knowing the business well enough to be able to make well informed predictions. Mark Creed, co-founder and technical director of hair salon group Philosophy Hairdressing, accepted this as a way of life until Shaw Gibbs came up with an idea. We offered a cloud-based accounting solution which combines with their management accounting services. This would enable Philosophy Hairdressing to access and manage their accounts from any computer or mobile device. "Doing our monthly accounts was also the most laborious, mind-numbing task. It entailed me sitting down for a day, poring over Excel spreadsheets. Not the best use of time, that's for sure, and not easy when you're abroad." Shaw Gibbs, which has handled Philosophy Hairdressing's accounts for eight years, suggested moving the company's accounting to Xero, a cloud-based platform which integrates all of their financial accounts, updates automatically and can be accessed anytime from any computer or mobile. 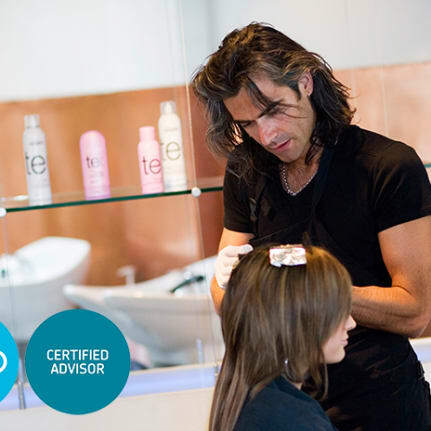 "The nature of Philosophy Hairdressing's business makes it the perfect candidate for Xero. A lot of the company’s bookkeeping is done 'on the go,' so, for example, it's a huge benefit for Mark to be able to access the accounts and records, whether he is in a salon or waiting for a plane." "For Shaw Gibbs it means we can also access the Philosophy Hairdressing’s accounts at any time. So we are on hand to answer queries, and can advise on issues with the same information in front of us, even if Mark is on the other side of the world," she adds. "The system has changed my life. All of those laborious bookkeeping tasks have receded and I can get on with doing what I do best. There's no more poring over spreadsheets as I handle the finances, make decisions and see our financial position, as I go." "There are obvious benefits to having access to up to the minute data wherever you are. In fact, we use Xero ourselves to do a high percentage of our bookkeeping assignments." She adds: "We are also now starting to implement a client portal whereby we can upload and download various client records. Specifically it can be used for electronic approval of documents, thereby cutting out email correspondence and postage. This works particularly well for overseas clients." Now, Philosophy Hairdressing is about to embark on a major expansion, as well as a complete rebrand. "Over the years we have grown solidly, building our team, providing our customers with a quality service from staff we train ourselves," he says.